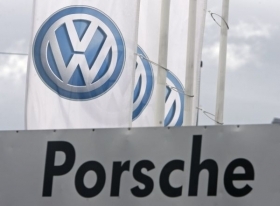 NEW YORK (Reuters) -- Porsche Automobil Holding SE won the dismissal of a New York lawsuit by 26 hedge funds that accused the German automaker of causing more than $1 billion of losses by cornering the market in Volkswagen AG shares. A five-justice panel of the New York State appeals court in Manhattan unanimously found today that Porsche had met its "heavy burden" to establish that the state was the wrong place in which to bring the lawsuit. The hedge funds accused Porsche of engineering a "massive short squeeze" in October 2008 by quietly buying nearly all of Volkswagen's freely traded ordinary shares in a bid to take over the company, despite publicly stating it had no plans to do so. When Porsche revealed its holdings, shares of VW soared, briefly making that German company the world's biggest by market value, and causing losses for hedge funds that had bet on a decline in the stock price. Robert Giuffra, a lawyer for Porsche, in an email called the decision an "important victory." James Heaton, a lawyer for the hedge funds, had no immediate comment. Last week, prosecutors in Porsche's hometown of Stuttgart announced market manipulation charges against former Porsche CEO Wendelin Wiedeking and former Chief Financial Officer Holger Haerter tied to the VW share purchases. The defendants' lawyers denied any wrongdoing by their clients.